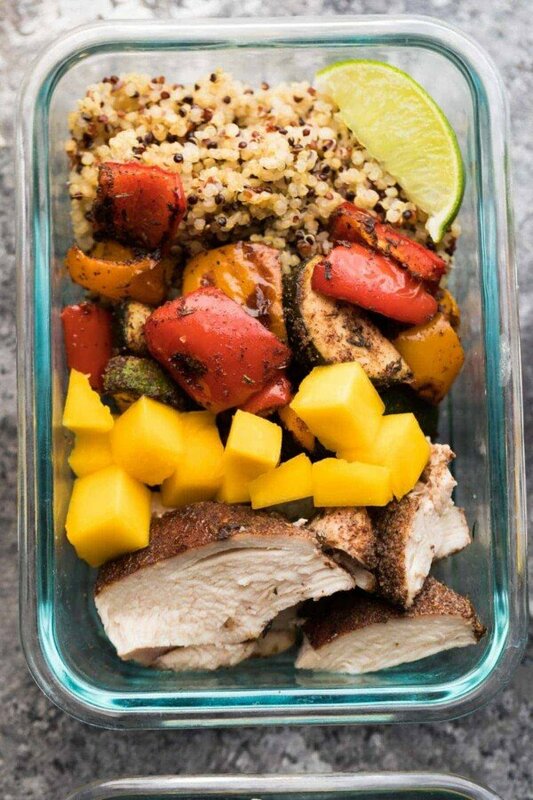 Jerk Chicken Meal Prep Lunch Bowls: bring a taste of the tropics to work with you! These lunch bowls are sweet and spicy, and packed full of healthy veggies and quinoa to power you through your afternoon. I’m so happy to be finally sharing this recipe with you! 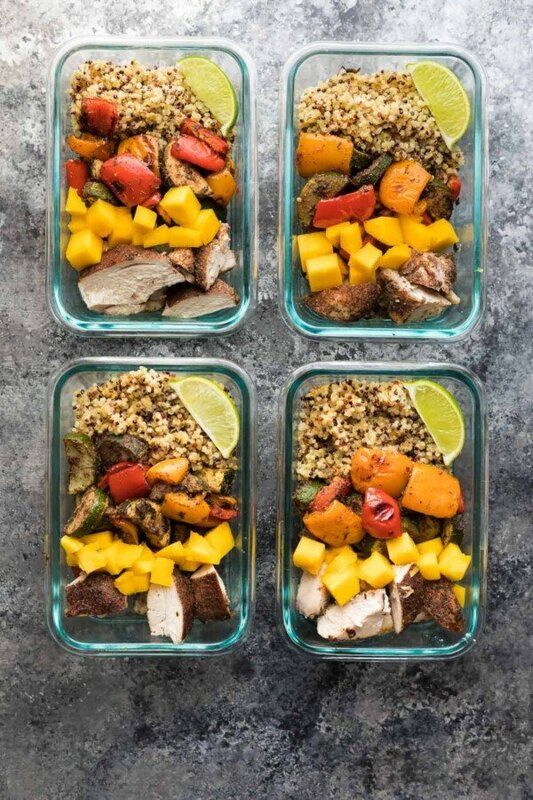 These jerk chicken meal prep lunch bowls have been sitting in draft mode since February 8. Isn’t that sad? I even teased our Lunch Prep Challengers with images, but wasn’t able to share it with you due to…morning sickness. For some reason, this little baby does not want mama to even look at a picture of chicken, but I have to tell you, I’m feeling fantastic today and these bowls look darn delicious. So I’m happy to be finally sharing this super simple recipe with you! It might not be 100% authentic in terms of the exact spice blend, but it definitely tastes good, especially with the fresh mangos…there is no better combination in the work if you ask me! These photos only contain 1 mango split between 4 bowls, but trust me, you’re going to want to up it…go for 2 mangos. 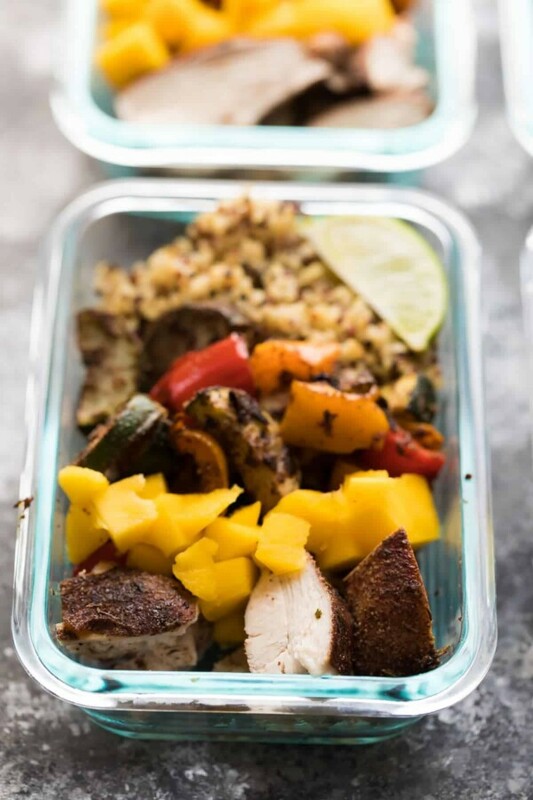 You really need the extra sweetness, it is the absolute best part of these jerk chicken meal prep lunch bowls! And absolutely, adjust the cayenne to taste. I like mine medium-hot, but I am also kind of a wuss. Ben, who puts Sriracha on everything would definitely want to crank it up. 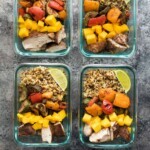 How I enjoyed my jerk chicken meal prep lunch bowls? Mix them all up and heat gently. If you want, keep the mango separate and add it to the heated bowls. Your choice! Swap the jerk chicken rub out for this brown sugar chili rub and add peaches or nectarines (you probably want to cut them fresh)…flavor bomb!! Stir together the rub ingredients and set aside. In a medium bowl, toss the chicken in half the olive oil and lime juice. Sprinkle with half the rub and toss to coat evenly. Arrange on a baking sheet and bake for 10 minutes. 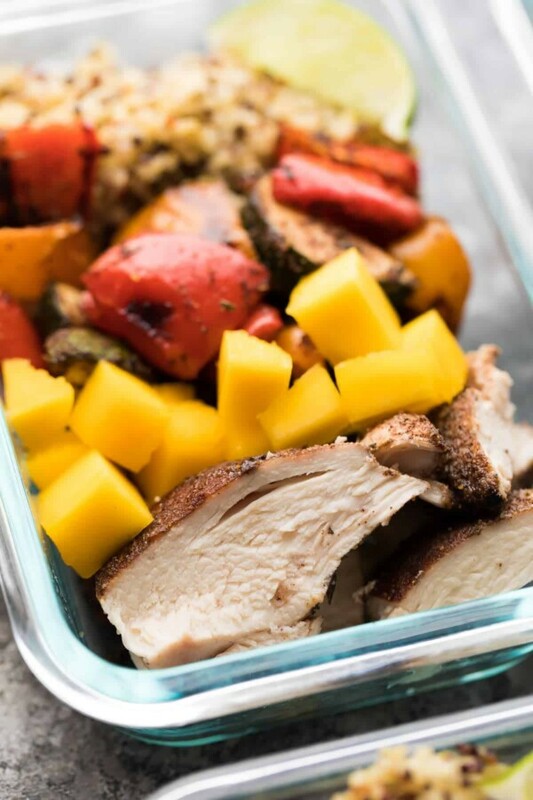 While chicken is baking, prepare the veggies: toss in the remaining olive oil, lime juice and rub. Arrange on a second baking sheet, or around the chicken breasts when the 10 minutes is up. Bake for another 15 minutes, until chicken and veggies are baked through. Divide cooled quinoa and veggies amongst four 2 cup capacity storage containers. Slice the chicken and divide evenly amongst the containers. StorageStore in sealed containers in the fridge for up to 4 days. To Re-heatMix everything up and re-heat gently OR keep mango separate until after heating. Previous Post: « New Recipe! Wow! These were amazing! My husband approved too! Made this recipe tonight, caught myself eating every little piece of chicken that “fell off” while slicing 😉 VERY good!! I can’t wait to devour these over the next few days, thanks for the recipe! Hi there. 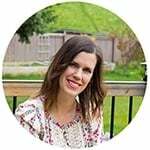 I recently found your blog and am trying out some of your yummy looking recipes. For your nutritional calculation, how much did you estimate your 2 large chicken breasts weighed? Thank you! Hi Lisa! The chicken breasts I use are around 7 oz each, so 14 oz total. For the nutrition I think I just selected ‘2 chicken breasts’, but I’ve played around with the MyFitnessPal calculator and gives me a really similar to putting in exact oz. Is there something that would sub in well for the mangos for a hubby with tropical fruit allergies? Meat made me nauseous in my first trimester with my first son…and he’s crazy about meat. haha I’m glad you’re feeling good and sharing them now because they look fantastic! I love jerk but have to go a little easy on the spice, so this is great! These lunch bowls look INSANELY good, Denise! I wouldn’t mind having these on standby for lunch every day! Oh wow, I would kill to have a fridge full of these, I am the WORST at lunch.